The Villas at Apple Creek is an active lifestyle community of low-maintenance homes in Appleton, Wisconsin. Developed by Epcon Communities, buyers are attracted to the carefree homeownership it provides. Situated in Central Wisconsin, residents are not far from Green Bay as well as access to great shopping, dining, and healthcare options. The Villas at Apple Creek is a vibrant neighborhood with private amenities and a busy calendar of social activities. The community's charming 3,000 square-foot clubhouse provides the perfect setting for residents to gather in the multi-purpose room, work out in the exercise room, or enjoy a cup of coffee from the catering kitchen. The heated pool offers an ideal location to work out outside or lounge on a warm summer day. Thoughtful amenities continue with picturesque ponds, providing a scenic neighborhood setting. The Villas at Apple Creek exhibits an attractive European style in a welcoming neighborhood setting. Epcon Communities began building homes within The Villas at Apple Creek in 2006. Upon completion, this ranch-home community contains 152 attached homes. Homebuyers can select a new or resale home offered in six models. These floor plans range in size from 1,182 to 1,922 square feet. These homes are built in quads or duplexes with two to three bedrooms, two bathrooms, and an attached two-car garage. Maintenance-free homeownership means residents will never have to worry about the burden of maintaining the exterior of their home as well as yard work. This gives them more time to enjoy all that the clubhouse has to offer. Popular clubs and activities include Bunco, casino night, happy hour, holiday parties, men's and women's clubs, pig roasts, and more. The Villas at Apple Creek is a tight-knit neighborhood where homeowners can create clubs and activities based on shared hobbies too. 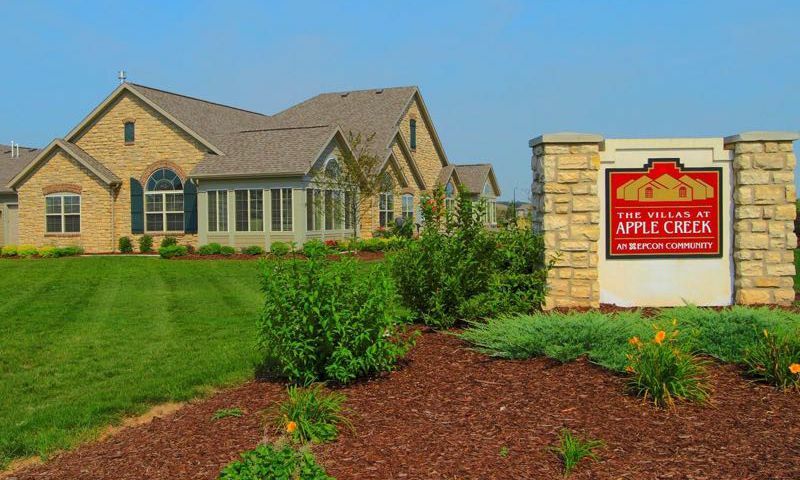 The Villas at Apple Creek is located in Appleton, Wisconsin just 30 minutes south of Green Bay. Residents have easy access to major roadways like Interstate 41 and Highway 441. There are numerous restaurants and daily conveniences nearby like the Piggly Wiggly, Ace Hardware, Express Convenience Center, and Simple Simon Bakery. Popular attractions in Appleton include the historic Hearthstone House, The History Museum at the Castle, and Northland Mall. Appleton is also home to 24 neighborhood parks and four community parks, providing plenty of opportunities for outdoor recreation. The Villas at Apple Creek is a sought-after community of low-maintenance homes in the great region of Central Wisconsin. There are plenty of activities available in The Villas at Apple Creek. Here is a sample of some of the clubs, activities and classes offered here. The Villas at Apple Creek will encompass 152 attached homes upon completion. Homebuyers can find a resale home that has between 1,182 and 1,922 square feet of living space. Epcon Communities has developed these low-maintenance homes with two to three bedrooms, two bathrooms, and an attached two-car garage. We like that our community is small enough to get to know everyone, but still offers a clubhouse, swimming pool, and lots of social activities. At first I was opposed to living in an attached home since we have always lived in a single family home, but we never hear our neighbors. It feels like we are living in free-standing home. Our neighbors are all wonderful and we all get along. It is nice living in a place where everyone looks out for each other. Couldn't be happier. 55places.com is not affiliated with the developer(s) or homeowners association of The Villas at Apple Creek. The information you submit is distributed to a 55places.com Partner Agent, who is a licensed real estate agent. The information regarding The Villas at Apple Creek has not been verified or approved by the developer or homeowners association. Please verify all information prior to purchasing. 55places.com is not responsible for any errors regarding the information displayed on this website.